OK, so I cheated a little. Eme and Joe were watching a movie, and Jimmy was wondering around, but Jacob, Tom, and I had a blast playing our new game. We got it at the Unique Thrift store 1/2 off day for a little over a buck, and it was a lot of fun. I was amazed that all of the pieces were there! t's for up to 4 players, and 9 and over, yet Tom did fine with a little coaching. Come on over sometimes, and you can play too! OOOH! That looks like a lot of fun. It was! And it was pretty quick. Only took about 45 minutes. Not one of those games that drags on for hours. 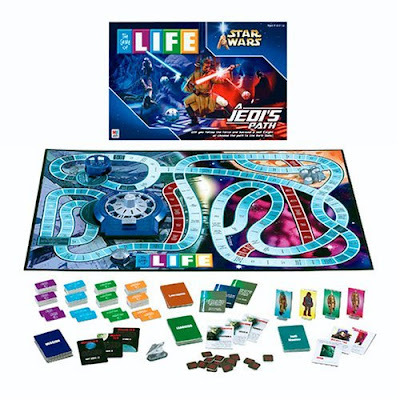 That's the game we always play if we go to Stan and Jessicas to play a board game..well not the fancy starwars version..
Just the regular life? I can remember playing that one at home. We used to have it. I always liked it! We bought it, but only have ever played it once. Too hard for the little kids to keep track of their money.